If you’re looking for something a little different this weekend than the Cherry Blossom Festival (which kicks off tomorrow), then maybe you should check out the We the People project this Sunday. This exhibition and performance event is from 2-5 pm at the Gallery W-16 of the Workhouse Arts Center in Lorton, VA. And it’s free. The We the People project honors Women’s History Month and SWAN Day (Support Women Artists Now) by highlighting a unique vision of America through the eyes of immigrant and American-born artists. Participating artists in We the People project were invited to interpret the theme, hope and opportunity as seen through their eyes, and express their thoughts, ideals and vision of a country that embraces the arts and celebrates innovation, diversity and creativity. Over 110 paintings, photography, sculptures, and fiber art are featured in the exhibition and available for sale, and poetry, readings, dance, harp music and film are presented as part of the performing program. Approximately 35 local visual, performing and media artists have been selected to participate in this exhibition. The exhibition runs through April 3,2009. 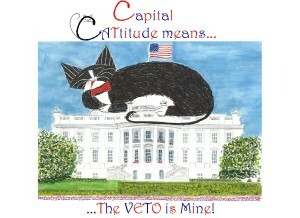 “Capital CATtitude means…”, by Sheldon Reiffenstein, one of the artists who will be present at the show.